We do not get too deep into politics here, but people do love our political themed ducks. When I saw Bill Clinton playing the saxophone on the Arsenio Hall show, I thought he would make a great duck. And it was. In fact, they were a big seller at the presidential library in Arkansas! Our next one was President Obama with our “Hope Floats” theme. Again, it did very well. Then we truly made “bath time great again” with our “Donald” Duck holding his hat which says, “Take Quack America.” This is probably our most popular duck ever and we continue to sell out of every one we make. 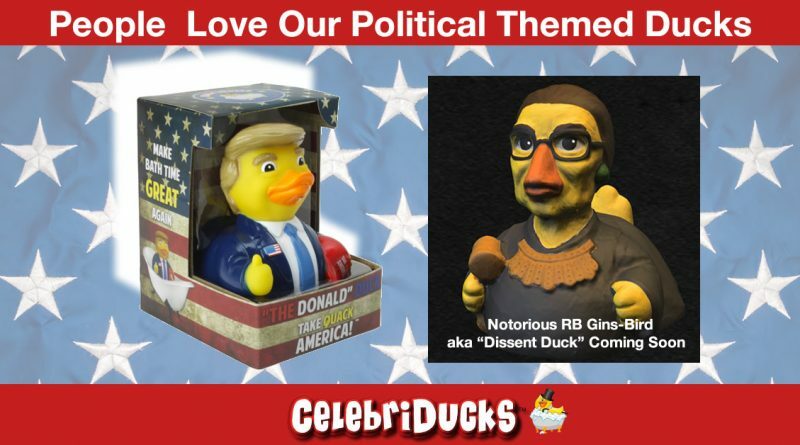 Obama and Clinton are sold out now and retired, but we needed to have a floating friend to go with the “Donald.” So who better to fit the bill, than Notorious RB Gins-Bird aka “Dissent Duck.” The interest in our newest political rubber ducky has been huge and we see another hit here. I think that you will agree that the “Dissent Duck” floating in the tub with the “Donald” Duck should make for some very entertaining bath time!